In addition to presentations of the new dishes there will be keynotes by Peter Barham (professor at the U. of Bristol, author of The Science of Cooking) and Heston Blumenthal (founder of The Fat Duck, author of The Big Fat Duck Cookbook). The program also includes masterclasses by Andrew Dornenburg and Karen Page (authors of Culinary Artistry, What to Drink with What You Eat and The Flavor Bible) on food pairing based on historical and contemporary recipes, and by Lorenzo Cerretani (professor at U. of Bologna) who will talk about food pairing and olive oil. So if you have an interest in food pairing and can afford the trip and the registration fee of â‚¬245 (which includes a seminar book with all the recipes) this is certainly an event you wouldn’t want to miss! 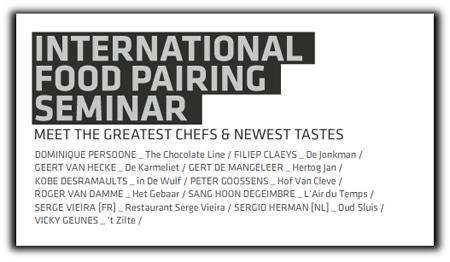 Luckily, for those who will not be able to participate, the recipes and food pairings from the event will be published on the Foodpairing website. As a sidenote I should mention that the “They go really well together” (TGRWT) blogging event has let bloggers and foodies explore various food pairings in 10 rounds which has resulted in about 100 different dishes in total. Links to the round-ups can be found on the right sidebar on the front page of the Khymos blog. And – drumroll please – the next round of TGRWT will soon be announced, so stay tuned! Those interested in the scientific considerations behind flavor pairings can find more info on this in previous posts. The topic however is controversial as the comments to this posts shows. This looks like quite the event… and YAY! for TGRWT returning! I am considering to attend. Anyone else?